Kutani-style plate Round dish of buff stoneware with slightly recessed bottom and everted lip. 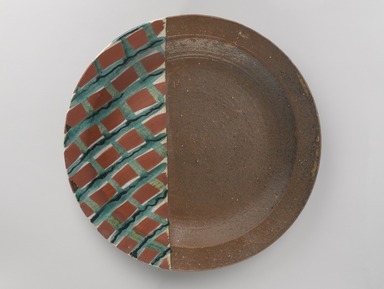 Except for footrim, 2/3 covered with a brown glaze, remaining 1/3 with a bluish clear glaze on which (obverse) is a red and green enamel checkerboard pattern with wavy black lines down the green stripes and (reverse) abstract red linear decoration and red signature, the katakana "RO". Condition: Minute chip our of footrim.